Non-traditional celebratory events, I always love. So of course unbirthday parties are awesome. Birthday parties are for children. We are adults and the remaining 364 days are for us to make up a reason to celebrate. 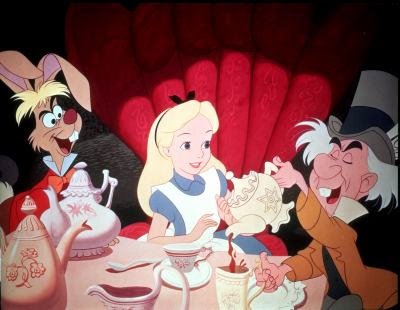 I have to say as a child, I could never get into Alice in Wonderland. I was amazed by the movies, but the rabbit is too much of a stickler for time. You’d think he was German. The tea party was truly the best scene. I wonder how many children, after watching this movie, tried to drink chemicals from under the sink with delusions of shrinking? Oh Mister Yuck, where are you? Indeed! Where IS Mr. Yuck. I think I’m going to try and find a tee-shirt with his logo on it today. Add one more to the novelty tee-shirt drawer. If I recall correctly, you observe Festivus, yes? It’s a Festivus miracle! Growing up in a family that put the “Q” in “Dysfunctional”, I really only look at three holidays as real ones. Nothing is better then remembering those that you’ve lost. Better yet, there is no to very little corporate whore association to this holiday. 3. Halloween of course. No further explanation required. Aside from your 30 rock party, what unusual celebrations are in the katemc39 line-up for 2010? Well, since you asked! I’m actually really excited (more than usual) about Halloween this year. I’ll be in NYC for the day and it’s really good there as there’s a terrific parade in the village (so many Spider-Mans) and everyone on the street is in costume. Fun. Also, I treat the Oscars almost like a holiday. As I am not particularly interested in sports, they are sort of like my Superbowl. So, I’m looking forward to that. Super cool. Thanks for that, nomnom. Totally makes me wish I had video editing skills.